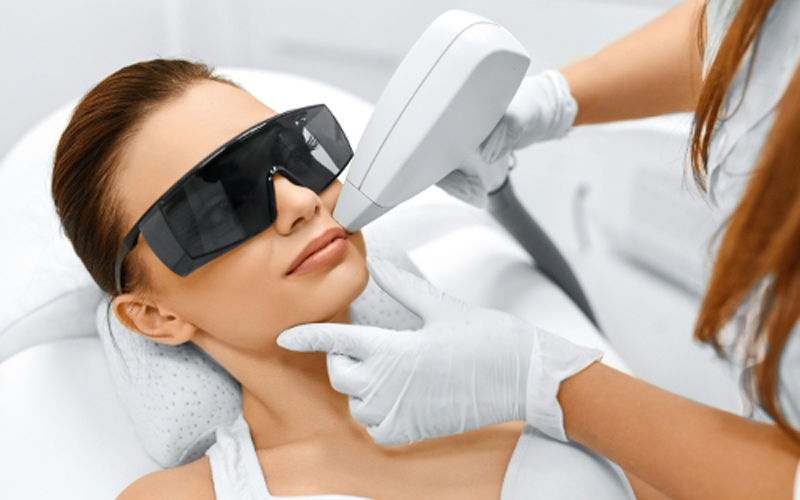 Laser Hair Removal is one of the most preferable techniques used today for getting rid of unwanted hairs. It reduces unwanted hair on legs, armpits, upper lip, chin, and the bikini lines. There are many techniques of hair removal then why to choose Laser Treatment? Each technique you chose such as shaving or waxing does not have long-term results, whereas the laser hair treatment gives you semi-permanent results. Another advantage of laser hair treatment is that it is little less painful than waxing. Hair grows from follicles or roots in cycles, not each follicle goes through the same cycle or speed. Laser hair removal uses laser technology that targets this follicles, it destroys the follicles which are about to enter the active stage for hair growth. This effectively stops the growth of hairs. There are no side effects on the skin or tissues of the surrounding skin. Due to hair growth cycles, the treatment takes 4-6 weeks to attain maximum results. The laser removal effectively works on lighter skin with dark hairs, compared to darker skin. After few days of the initial treatment, you may notice new hair growth at the site of the laser removal treatment. It is because of the hairs that stay inside the follicle at the time of treatment and had not grown enough to be visible for treatment. This hair grows now and can be removed with gentle and care. If it is still attached with roots than wait for a day or two to remove it from the surface. It is not as simple as it sounds, you are going to deal with laser or we can say immense heat that destroys the melanin the exact path that gives color to the hair. If you choose to go to someone who is not professional enough to perform the procedure, the laser hair removal could leave burns or scars on the skin. The best decision may be choosing an expert who can make things as simple as it sounds. StyleU Salon one of the best choices for women, has the perfect panel of laser removal professionals who analyse your hairs and guide you with the systematic approach from start to finish. You will experience a Unique and Premium standard for hair removal technology. The other reason for choosing a professional is the experience and the products they use. The experts of StyleU Salon believe in most effective treatments and quality products for the best possible outcomes of your money. • Semi-Permanent hair removal result, it has a long-term effect than shaving and waxing. • Can treat anywhere on the body. It can treat large, small or hard-to-reach areas easily. • Less painful compared to electrolysis and waxing. • Takes multiple settings for maximum results. • Always visit an expert for beneficial results. Choosing safe and effective hair removal technique is crucial. StyleU Salon one of the leading salons, can help you learn more about the treatment and guide you to attain maximum long-lasting results with satisfaction. By this, you can embrace your glowing skins and confidence.